A Federal High Court in Lagos had fixed July 4 for ruling on a bail application filed by former Finance Minister, Nenadi Usman, and former Media Director, PDP Campaign Organisation, Femi Fani-Kayode. The Spokesman, Economic and Financial Crimes Commission, Mr. Wilson Uwujaren, in a statement on Friday in Abuja, said the court had ordered that the duo be remanded in prison. Uwujaren stated that Justice M.S. Hassan adjourned the ruling following a bail application filed and moved by Ferdinand Orbih (SAN), the lead Counsel to the defendants. He noted that Orbih had urged the court to admit the two to bail on self-recognition, pending the hearing and determination of the charges preferred against them. The EFCC spokesman said the Prosecution Counsel, Nkereuwem Anana, opposed the application and urged the court to impose stiff conditions if it would exercise its discretion in favour of the defendants by compelling the two to be in court for their trial. 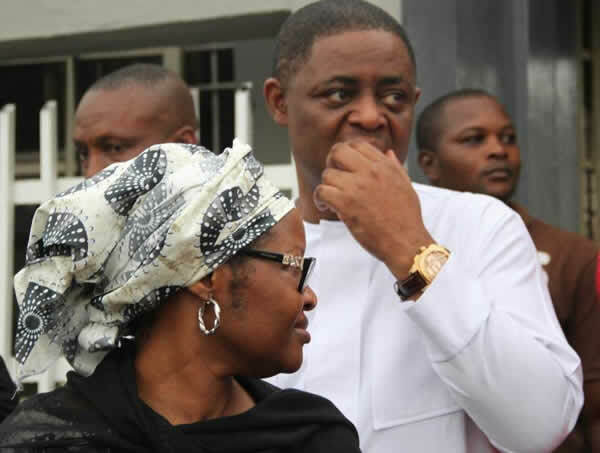 The Commission had on June 28 arraigned Fani-Kayode, Usman, alongside Danjuma Yusuf and Jointrust Dimensions Nigeria Ltd on a 17-count charge bordering on conspiracy and corruption. The defendants were alleged to have diverted about N4.9bn belonging to the Federal Government of Nigeria for political and personal uses. However, they had pleaded not guilty to the charges brought against them.